FAQ: How Many Gallons Can an Onion Tank Hold? Question: Hello. I was looking at your onion water tanks and I was wondering how many gallons they were able to hold. I am looking for a type of easy water storage on my site during construction. Answer: Thank you for contacting us! The onion tank is one of many in our collapsible tanks variety, making it naturally flexible in nature. For this reason, this self-supporting tank is made to handle a wide range of capacities with standard sizes from 250 to 10,000 gallons. These collapsible onion tanks are self-rising and capable of handling many types of water, including potable water. Questions? We can help! Call the GEI Works team at +1-772-646-0597 or fill out our quote request form to discuss your project. The Self-Rising Tank is Ready to Go in Minutes! Self-Rising Collar: The self-rising collar on these tanks allows them to rise on their own as they are filled with water. This provides a fast-setup time for tanks and removes the hassle of filling water tanks. Open Top: The open top design on these tanks make them easy to fill with water. This has made them ideal for fire relief efforts, construction sites, and even emergency water supply relief. 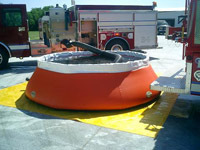 Portable: As a member of the collapsible tank product line, these onion water tanks lie flat when they are empty for easy transportation around various locations. This removes hassles and creates a fast way to bring needed water storage to remote or isolated locations. 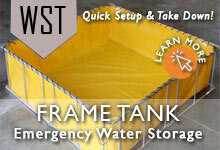 View our Pillow Tank page for information on all our collapsible water storage tank options.